The governess reveals that on her second evening at Bly she had received from the children’s uncle a letter forwarded from the head-master at Miles’s school. He hadn’t yet opened the letter, and requested that the governess not bring up with him whatever business happened to be contained in the letter. Much to the governess’s dismay, the letter announced that Miles had been expelled from his school, but it offered no explanation for why that was the case. It is interesting that, even though the governess received the letter announcing Miles’s expulsion on her first night at Bly, she withholds this information from the reader until now. The motives for this are unclear, though it is our first encounter with the secrecy and holding back that will occur frequently in the book. The governess confides in Mrs. Grose about the announcement of Miles’s expulsion, and she seeks from Mrs. Grose an explanation. Mrs. Grose comes to Miles’s defense, saying she cannot imagine what he could have done, since he is by all appearances an impeccably behaved “young gentleman.” The governess asks whether or not Mrs. Grose has ever known Miles to misbehave, and she replies that though he has misbehaved occasionally, that’s for the better, since no boy should always be perfect. Mrs. Grose’s reluctance to speak honestly with the governess about Miles’s behavior is a first glimpse at the secrecy that later becomes such a destructive force between these two caregivers. Mrs. Grose’s refusal to criticize Miles is likely a function of the belief that children, like Miles, are always to be understood as innocent. The next day is the day of Miles’s arrival. Before leaving to meet Miles, the governess asks Mrs. Grose what happened to the previous governess. Mrs. Grose replies that she does not know exactly what happened. She says only that one day the old governess left, apparently having fallen ill, and not long thereafter she heard from the children’s uncle that the previous governess had died. The governess asks, further, whether or not the previous governess had ever seen anything to be worried about in Miles. Mrs. Grose replies that, no, the previous governess had never mentioned anything like that, at least not directly to her. Here is further evidence of the secrecy that is going to be developed between the governess and Mrs. Grose, especially in matters regarding the children’s behavior and their presumed innocence. The previous governess’s unexplained disappearance hints at the supernatural atmosphere that will soon be introduced into the governess’s story. Though it's also worth noting that the unexplained disappearance may have a perfectly normal explanation, but because it isn't explained may play in the governess's mind as something sinister and speaking to the supernatural. Put differently, it's never clear if the governess is perceiving supernatural events that suffuse Bly, or if the governess, based on the past history and things she doesn't know, is imagining them. Downes-Angus, John. "The Turn of the Screw Chapter 2." LitCharts. LitCharts LLC, 1 Dec 2013. Web. 24 Apr 2019. Downes-Angus, John. "The Turn of the Screw Chapter 2." LitCharts LLC, December 1, 2013. 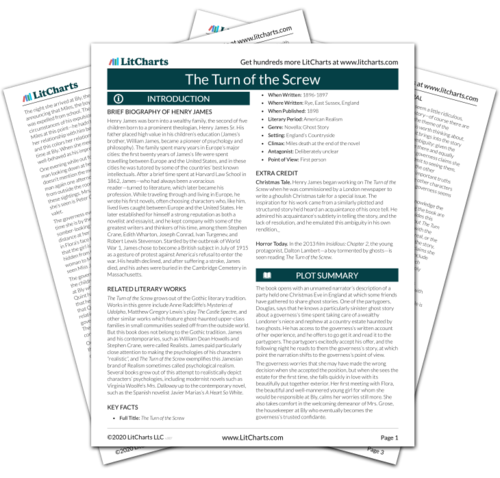 Retrieved April 24, 2019. https://www.litcharts.com/lit/the-turn-of-the-screw/chapter-2.